Which pen plating kit would be best for you? 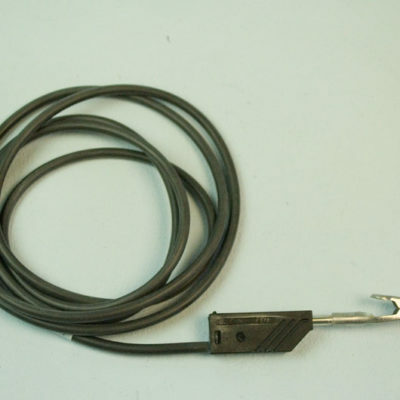 Rust proof, made from stainless steel including the spring and hinge. 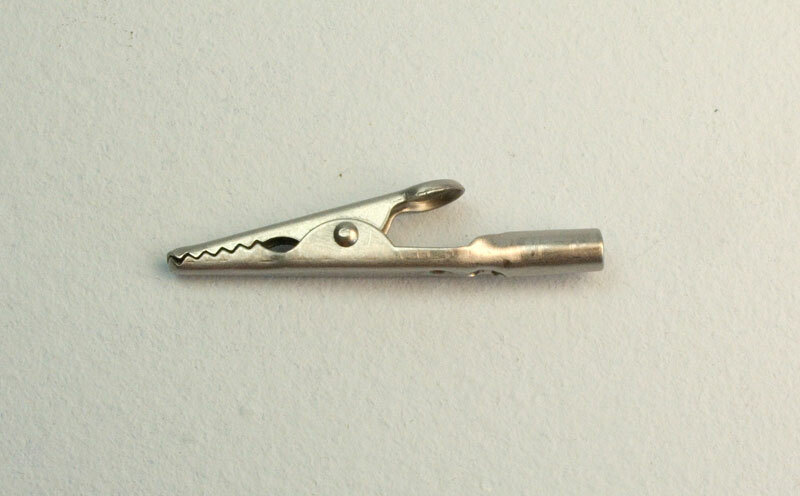 This crocodile clip gets rid of the risk of contamination – plus it lasts up to 200 times longer than plated clips. 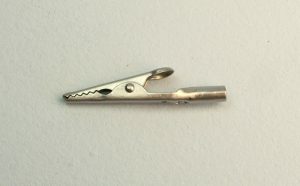 Crocodile clip holding work. 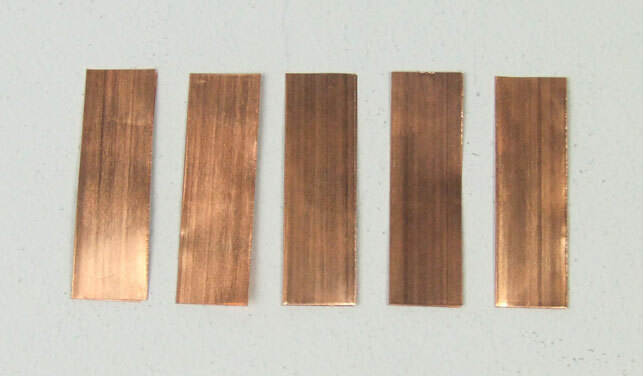 To see the full project, please click HERE for our Electroplating Manual. These rust proof clips are designed to give a very long service life of up to fifty times that when compared to their nickel or zinc plated steel counterparts. 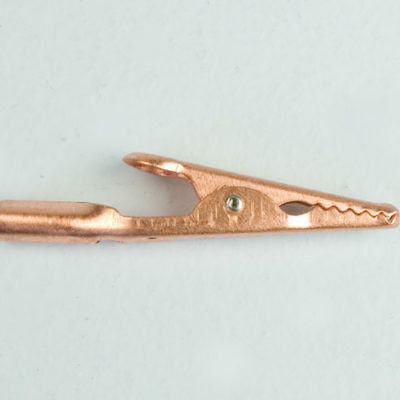 Made from the highest quality, rust proof parts, these clips are guaranteed to eliminate all problems caused by rusty contacts. Well worth that little bit extra! This project takes you through the stages of silver brush plating onto EPNS or electroplated nickel silver. 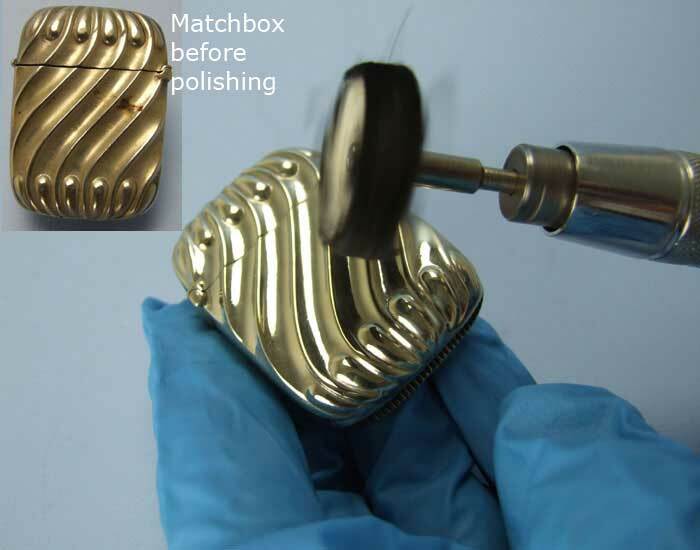 This is a relatively straightforward job with our Silver Brush Plating Solution. Once you have mastered this technique, you will be able to restore and upcycle most pieces of EPNS, a service that you will find is popular amongst your more discerning customers. 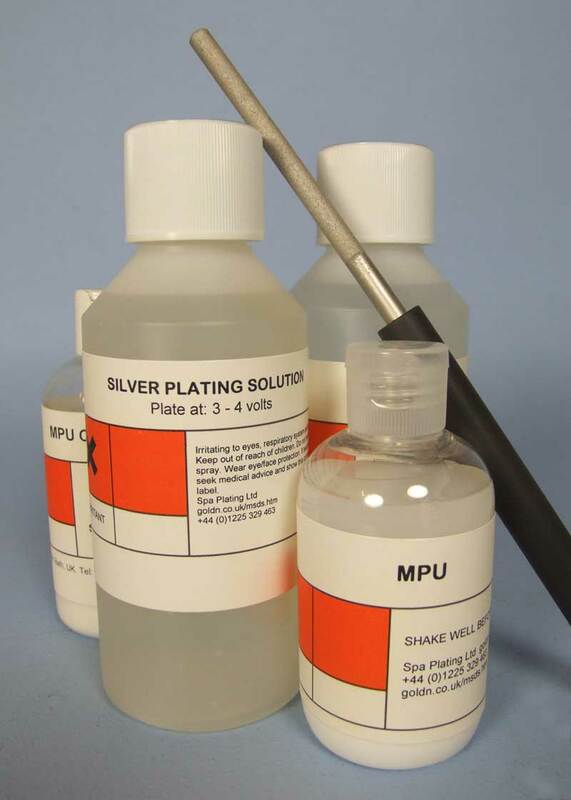 Solutions; Silver Brush Plating Solution, MPU, MPU Coarse. 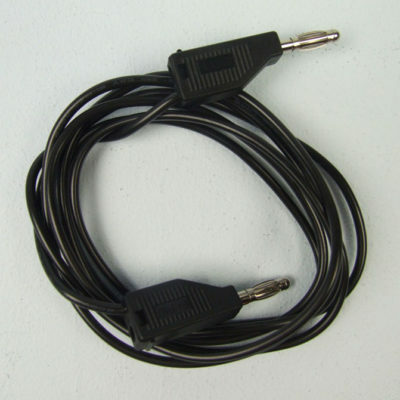 Equipment; one Electrode Handle, fitted with a Silver or Platinum Electrode. For help with setting up your brush plating equipment, please click HERE for a guide. The original surface of the matchbox was considerably tarnished and had many small scratches. These were removed by first polishing on the buffing wheel and finishing with a Dremmel mop. The mop was mounted in a pendant drill and was used for reaching the small nooks and crannies in the curved design on the matchbox’s surface. 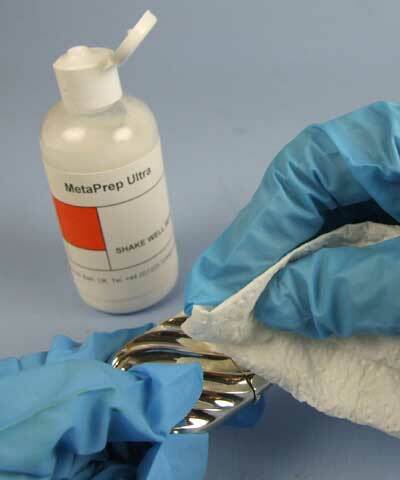 Give the piece you are working on a thorough clean with MPU to remove all traces of the polishing compound. We find kitchen tissue paper is the best for this, using a firm rubbing action. Continue with clean sheets of tissue, until there are no traces of polishing compound left. 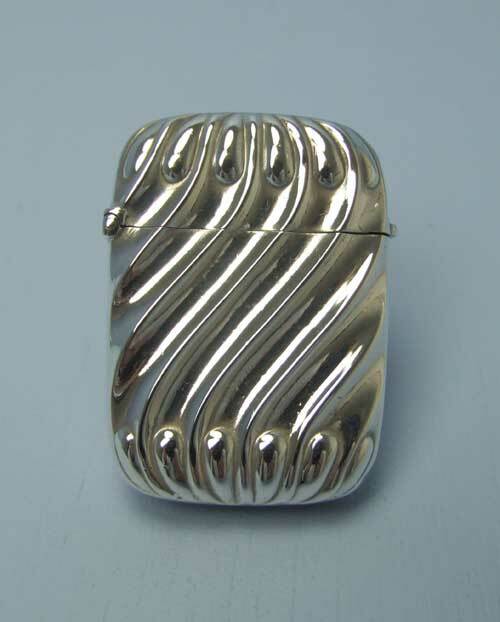 To build a solid layer of silver, keep moving the swab over your work in regular circular movements and dipping it into the silver solution to replenish it. To estimate how long you need to plate and how much plating solution you need to achieve a particular thickness, please refer to our Plating Calculator which can be found on all of our product pages. 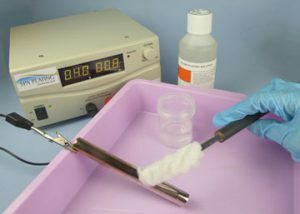 NB If the surface you are plating has many hollows and/or raised areas (created by repousse or embossing for example), it may be easier to use one of our Extra Fluffy Swabs to get into the difficult to reach spots. Finish as usual with MetaSeal. International orders usually 3-5 working days. For all price quotations for deliveries, please add your items to our shopping cart. You will be able to see the shipping costs by clicking on the ‘Calculate shipping’ button in the cart and before checking out.